Needs must sometimes and hunger drove our needs today. After supporting the Crofton Library Craft Fair we headed into Wakefield for a bout of pre holiday shopping. Sadly the two independent cafés were closed so we headed into Handmade Burger Co.
We were greeted and seated swiftly by our smiley waitress and were offered a run down of how the ordering works, how you can tailor your burger as they are all made to order. My choice was easy, I opted for the organic offering – Jimmy’s Beef Cheese Classic. I hope it lives up to my expectations. I was intrigued by the Yorkie burger but i resisted and played it safe (burger encased in two Yorkshire Puddings). Drinks were priced as you’d expect at £4.95 for a Pinto Grigio Rose for 175ml and £2.85 for the bottomless soft drink..
First impressions were good and the escaped chunk of burger I tasted had good flavour just not juicy. 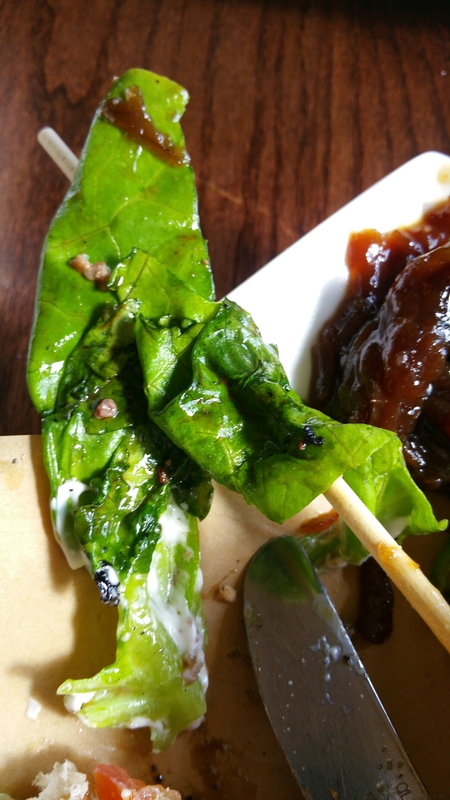 My first bite was owned by the amount of onion relish /marmalade dolloped on the burger which was obscene. 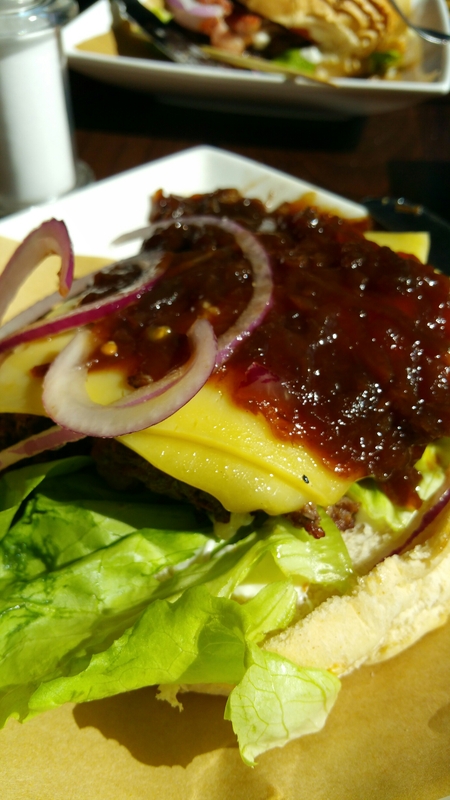 Once scrapped off, with the cheese revealed I could taste the burger and my first impressions remained decent flavour but quite dry. I think the bun could have been better as it crumbled a bit as I tucked in or maybe they could toast the bun that stops the rot. Speaking of rot, not so fond of lettuce which is ready for its new life in the composting bin (see exhibit A). There was a need for better salad toppings; maybe big beefy tomatoe but this is not a deal breaker. Overall despite some flaws this is better that GBK and as most chain restaurants the meal priced for two mains with drinks at £28.95 in a city centre is about average centre. I ewould revisit in a moment of hunger but it’s not going to be a regular haunt. If you like my blog you can follow me on Twitter. Independent cafe on our last weekend in Whitby. We have been coming to Whitby for a few years now as a couple and as coffee lovers realised we were probably missing a trick relying on Costa for our caffeine hit. (Plus we hate that certain staff leaders start wrapping up a whole 90 minutes before they close – not exactly a warm welcome). You enter the cafe through a delightful walled patio area. We headed into the cafe to a warm welcome and display of homemade bakes. One of which, a Lemon & Thyme Loaf, was just cooling off ready for tomorrows lucky customers. We only ordered drinks as we were dining at The Magpie within the hour but my eyes certainly enjoyed a feast. I ordered a Flat White which was served in a beautiful teacup. Davids americano was served in a China mug. Both coffee were excellent and at £4.90 were priced well for the serving. We had a great experience at Rusty Shears and think you would too. Never baked Lemon Drizzle before yesterday but a dear colleague is moving on to new challenges and this cake is her favorite. It’s taken me a while to find the elusive 30 x 23 cms tray that Mary Berry uses (if you follow me on twitter you may have caught my grumblings). I was tempted to pimp this but i’m playing safe today. Grease and line your 30 x 23 cms tin with baking parchment/paper (remember, if you use larger tin you wont get the same rise). Line your tin I and heat your oven to 140°c (fan) or Gas mark 3 then weigh out and prepare your ingredients but hold on for the crunchy topping. Measure the butter, caster sugar, SR flour, baking powder,eggs, milk and lemon zest/rind into your bowl and beat until well blended. Remember your butter must be soft to touch before your start this process. Leave the bake in the tin to cool for five minutes. Cut into squares once cold. My oven was slightly too hot – school girl error – always check your temperature or expect that doming. The lemons, despite being fabulously juicy, produced a lot of juice which is never a bad thing. However I think the amount of juice they produced took the crunch from the topping – too much juice to sugar. It could also have been that the bake was too warm and melting the sugar . What I do know is that baking is a learning curve and next time I will measure juice to try and find that perfect mix and use a more averaged size lemon. In the meantime a cheats sprinkle of granulated the morning after gave these the crunch they deserved. Every cloud has a silver lining as these lemons gave me an incredibly zest and moist lemon drizzle and I look forward to baking this again but next time with some savory thyme. Hope you like this and my pictures and if you try this with a twist then please share your thoughts. If you like my blog why not follow me on Twitter or Instagram. Following a great weekend of racing at the fabulous York Racecourse and breaking even despite our best efforts, we wandered around York city seeking a independent eatery for our late luncheon. Our wandering around was soon rewarded when we came across The Fossgate Social. The venue was buzzing, perfectly volume for a lazy Sunday. Ts and the looming black clouds we avoided the rear terrace and headed upstairs to the first floor and secured a table for two. David was quick to chose after short discussion but sadly our neighbours broke the news the meatball sandwich was sold out – good going for 1:45pm We were tempted by the Mountain Valley Brunches (see board above and I would ask for this you go) but after the weekend’s excesses we played it safe. David ordered the Ham & Cheese Toasted Sandwich with full grain mustard served on Haxby Bakehouse with beetroot and juicy gherkin on the side. I decided a Bacon Sarnie with Tomato Relish was going to hit the spot. I placed our order at the bar, the staff were instant to acknowledge me and let me know they’d be with me soon and they were. They took the order and asked if we could wait 20 minutes for the order. This to me is always a comforting sign, as any good food is always worth the wait. When our orders arrived on first look neither of us were disappointed, despite going for the less decadent options. The bacon was thick and just salty enough and had been cooked well done, as requested. 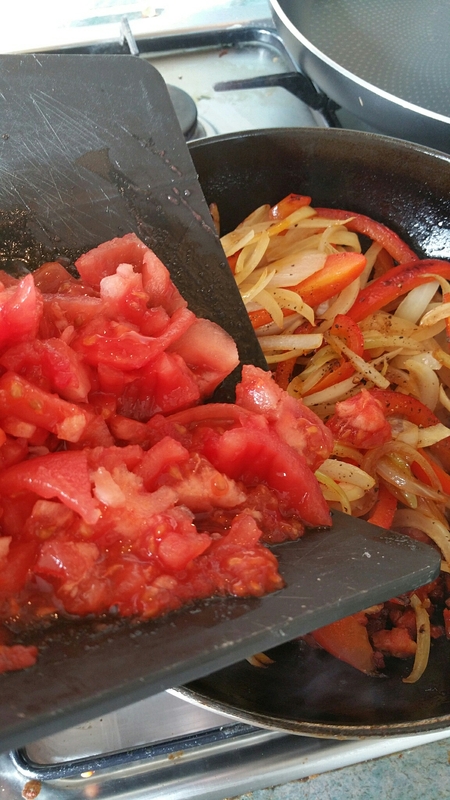 The tomato relish was divine – as much as I love tomatoes I never have really enjoyed them in relish form until today. My only mistake was not asking the sociable team where the relish came from or what it was made with. Made this first for my Mum’s birthday meal. My mum doesn’t have the sweetest tooth in the family that belongs to my Dad. He truly is a pudding / dessert lover…and if he could, he would eat puddings for starters, mains and afters! They both raved about this pudding, in fact Dad said its the best pudding he’s ever had. Since then David’s parents have enjoyed this and they have requested this for the Ord family Easter Sunday dinner. With this in mind I thought it was time to share this wonderful pudding with you. 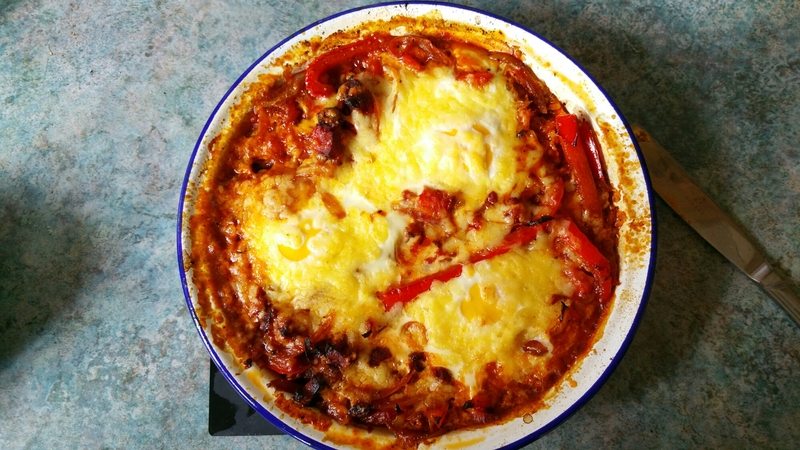 I first found on the BBC Good Food website and I have made no tweaks as its perfect. Butter a 2-litre baking dish and heat oven to 160°C fan/gas 4 and put your kettle on. Put the flour, caster sugar, 50g cocoa, baking powder, orange zest and a pinch of salt in a large mixing bowl. Chop your chocolate into pieces. I aim for pieces about the size of a Cadburys’ buttons give or take; this means you find lovely pieces of half melted chocolate in each mouthful. Squeeze the orange juice into a pyrex jug and whisk in the 3 eggs, melted butter and milk. Mix 300ml of boiling water from your kettle with the light muscavodo sugar and remaining 25g of cocoa for the sauce. Slowly pour this all over the pudding batter which will look very wrong at this stage! The Bake on the middle shelf of the oven for 30 mins or until the surface looks firm, risen and crisp. I hope you like this pudding as much as we do and if you do try this please let me know if you make any additions as I’m always looking for new ideas. I was asked today by David to share for our friend some of my favourite meals. The easiest way to transfer recipes to those that ask for help could be to send them the respective cook books but in this case as the person in question is an avid reader of my blog and twitter I thought to salute their support by blogging instead. 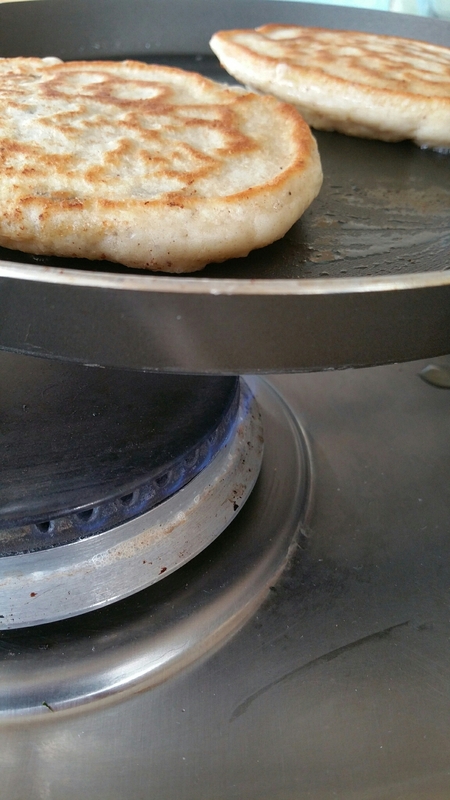 You will need a skillet pan or maybe a small wok for this. Add the Oregano (tablespoon) stir once. If you love Parmesan like we do grate a bit more on top. Now this is an odd side dish, but if you like carbs with carbs here you go..
We love this french classic and it is best eaten on the night it does not reheat well. You can do 50/50 and use milk as well as cream if the ladies in the house prefer the lighter version. Ideally the potatoes need to be this thin to give the best and fastest result. Once the potatoes are sliced work fast to layer them in the dish, side by side, making layers upon layers, keeping flat . When you have run out of potato slices pour over the seasoned cream. Press down gently with a fork. Eat with sighs of ooh and aahh. Happy cooking Michael and if you need to consult on any of the above my number is only at the rate of £1.00 per minute from a land line. Isn’t it funny how we can forget about dishes in our repitoire and they disappear into fond food memories. Well today, I decided to revisit this wonderful dish that I disovered via my first food hero Delia. My bookshelves are full of her books but this new wonder foodie resource DeliaOnline has become a go to for me. Delia recommends a shallow gratin dishe measuring 6 inches (15 cm) in diameter, which will hold one or two eggs I use my Falcon enamel round pie dish or the recatangular version. Step 1 turn your oven on to 180ºc (fan) or gas mark 4. Step 2 deseed the pepper, remove the white flesh cut in half, then quarters and slice finely into lengths. Step 3 Peel your onion and cut in half and cut into thin spears. 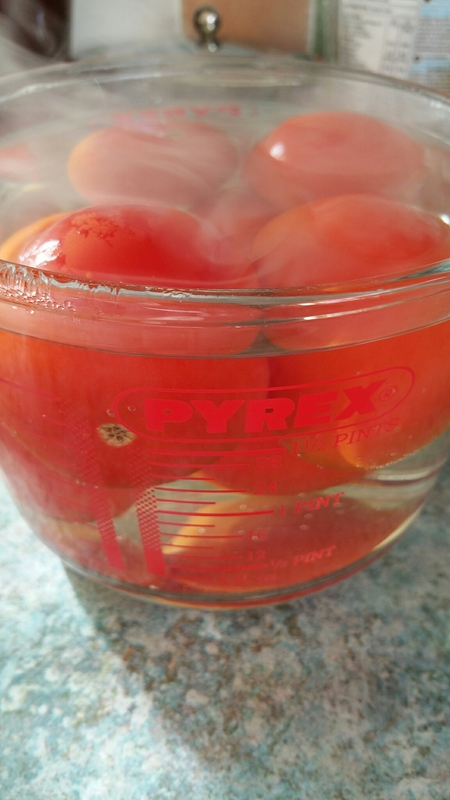 Step 4 Boil your kettle and put the tomatoes into a large (1 litre Pyrex jug) and cover the tomatoes. Within 1 minute they will be ready to be skinned. Some of the skins might be difficult to remove, I leave the odd bit on. (Delia removes the seeds I prefer to leave the seeds in; each to their own). Step 5 next chop the tomatoes into pieces and then finely chop the garlic. 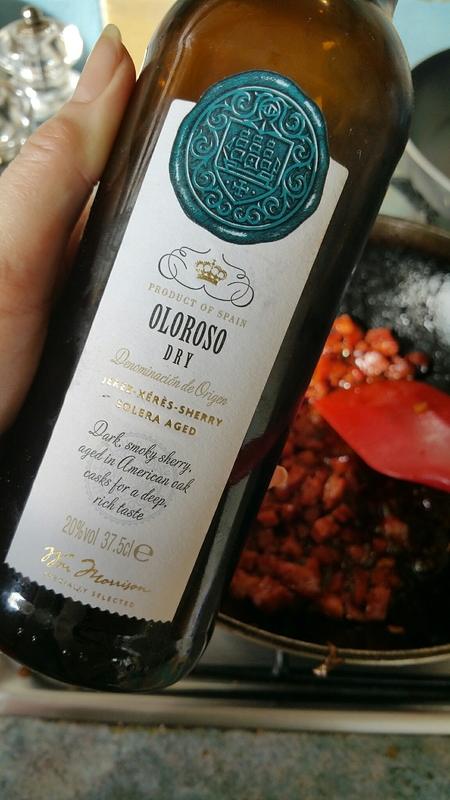 Step 6 heat a pan (I used a small wok for this dish) with about a tablespoon of oil (I used rapeseed) when the oil is hot add the chorizo pieces to brown them off, I added a slug of Oloroso Sherry just to make it that little bit more spanish. Once cooked off I then place these into the dish I am going to use. 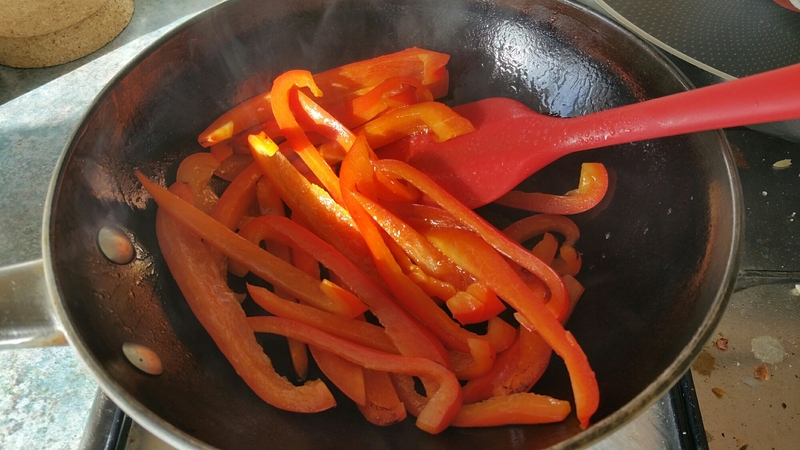 Step 7 Add the onion and pepper to the pan and cook on a high heat, until they are starting to soft with brown edges – this will take about 5 to 10 minutes depending on the thickeness of the slices. 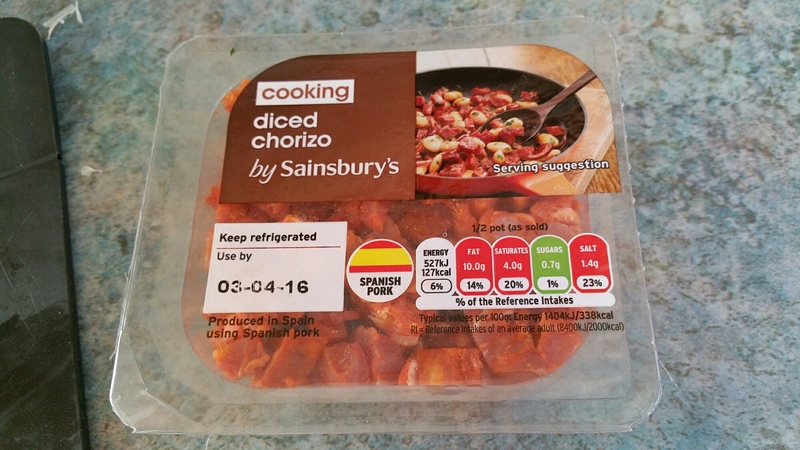 Step 8 add the chopped tomatoes and garlic and cook for 1 minute more and return the browned chorizo to the pan. Give it a good turn around to meld all the flavours. Step 9 season well with freshly ground salt and black pepper. Step 10 take the pan off the heat heat and place the mixture in the dish. Break your eggs into the dish (as I am using a one pot I space these out equally) . 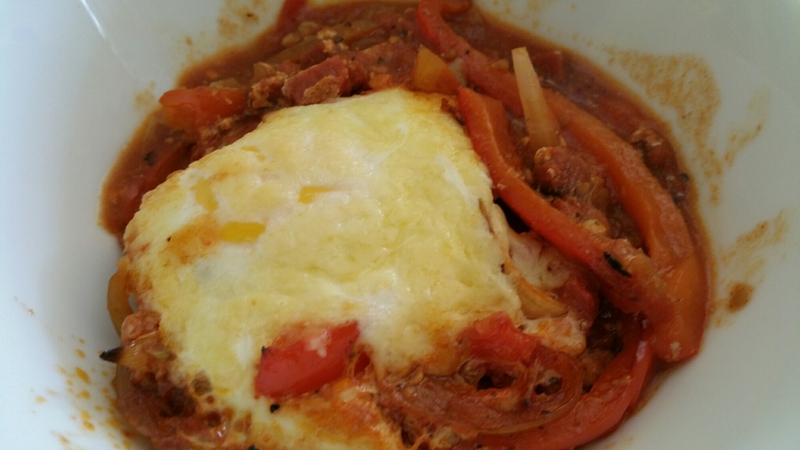 If you use indiviudal dishes then sit you eggs side by side on top of the mixture. 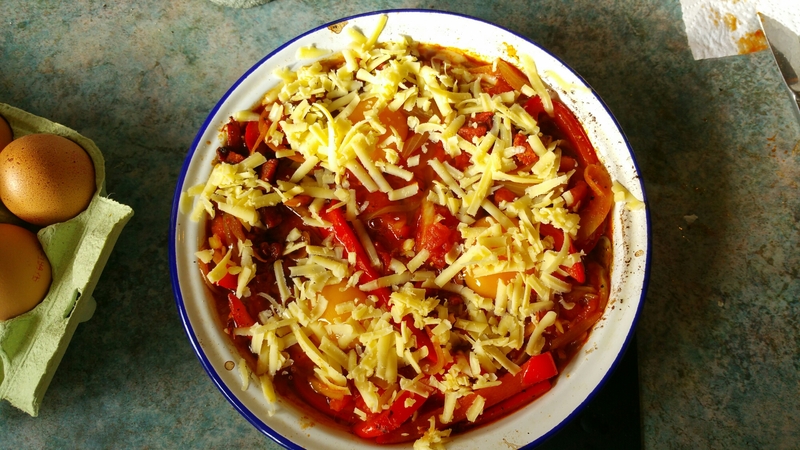 Step 11 now you should have the mixture with eggs sat on top so season and sprinkle each one with your grated cheese. Step 12 place the dish or dishes on the baking sheet on the top shelf of the oven to cook for 12-15 minutes (or a little longer, depending on how you like your eggs). Thanks for reading my blog and I would love to read your comments. If you like my blog then you can follow me on Twitter @EatBakeBlogGB or read my restaurant reviews on TripAdvisor. © EatBakeBlogGB / Louise Winder Food & Travel all rights reserved. Who doesn’t love Pancakes. It’s one of my first positive food memories that repeats through my life. My mum made great Pancakes and always served with a sprinkle of sugar and a squeeze of Jif Lemon (not sure why we never had fresh lemons). I have carried on that tradition on, until recently as I’ve started having pancakes as a treat breakfast. Crack the egg into the middle and start to mix in. 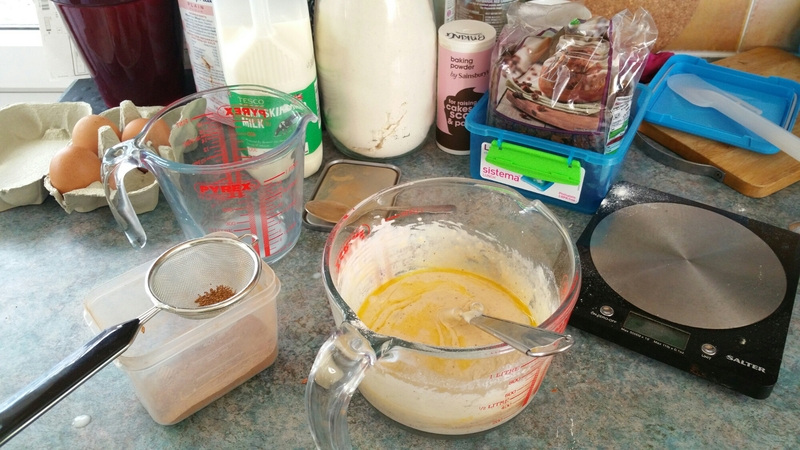 Then add the Milk mixing as you go until you have a thick batter. Next melt a nob of butter in your pancake pan and add this to your mix and stir in. Finally add your Sultanas and leave the batter to rest. An hour if you can and if you have no patience like me, then five minutes; this let’s the ingredients meld together and the starch molecules in the flour are absorbing the liquid in the batter making the batter thicker. 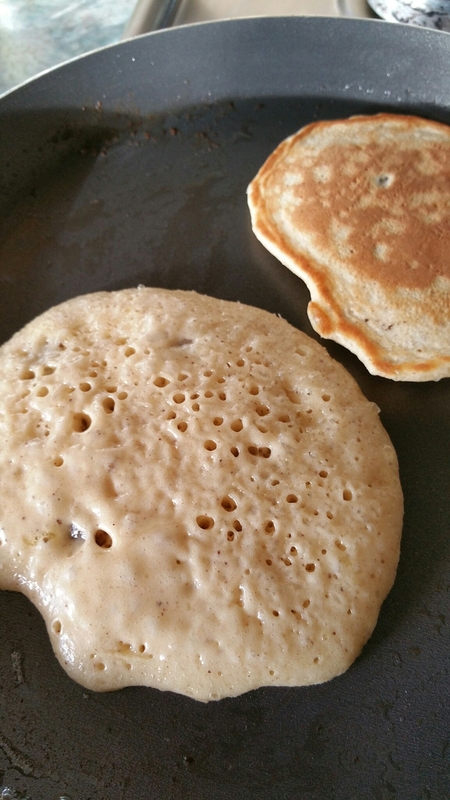 This causes them to swell and gives the batter a thicker, more viscous consistency. Then I use peanut oil to oil the pan and put it on a low light. Then serve with or without Maple Syrup (other brands are available but this was on offer). I loved these and as a huge fan of Cinnamon they will be a new Sunday treat . Tonight we will be having traditional pancakes unless I’m out voted! Hope you enjoy your Shrove Tuesday. 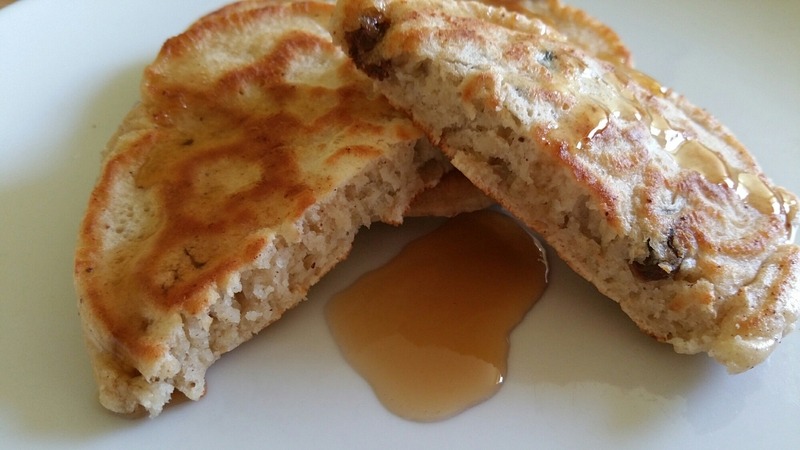 Who doesn’t love Pancakes. It’s one of my first positive food memories that repeats through my life. My mum made great Pancakes and always served with a sprinkle of sugar and a squeeze of Jif Lemon (how seventies). I have carried on that tradition on until recently. I loved these but i am a huge fan of Cinnamon Tonight we will be having with the traditional pancakes unless I’m out voted. Ever since I dined at the Saddleroom in beautiful Coverdale over a year ago I have been trying to recreate this brownie which was a little piece of heaven. Equipment you will need : scales, large glass bowl (about 20cms in diameter), pan to sit the bowl on, good heatproof spatula or wooden spoon, fork or whisk, baking parchment (greaseproof paper) and a square bake tin (21cms or 22cms). The method. I writing this bullet pointed as I think it makes it easier to follow, but first heat your oven to 180C or if a fan 160C (equivalent Gas mark 4) and lightly grease a square non-stick baking tin and line it with baking parchment /greaseproof paper. Put a pan of water (about a 1/4 full) on to simmer and place the glass bowl that sits neatly on top making sure the water is not too high that it is touching the bottom of the glass bowl. Add both sugars and the cocoa and stir regularly so it doesn’t stick until the sugar is dissolved and you have a rich chocolate mix. Add the beaten eggs bit-by-bit into the mix until you have a smooth and glossy mix. Stir in the self raising flour and chopped hazelnuts and the rum and mix until you cannot see any flour (really scrap down into the bottom of that glass bowl). Pour the mixture into your lined tin. Place in the oven on a middle shelf and bake for 35 minute or longer if needed (check by putting a skewer (or a sharp knife) into the mix our looking for a slightly clean blade. Remove and leave to cool in the tin – this is really important; your brownie is still cooking and developing its flavour. Turn out only once it is cool. I turn it out onto a board so I have the base upwards it makes cutting it easier as the top should be crunchy and it will crumble. Your Brownies should keep in an airtight (I use an old biscuit tin lined with greaseproof paper) for about 3 days and we are sure it tastes better on day 2. This is still the best brownie I have made but I am still seeking the chewy perfection. Thanks for reading my blog and if you like this then please show your support and comment below or share on social media.